And, although I greedily devoured this memoir expecting at every page turn to uncover more of Annie Proulx, the person, it finally, as I finished the last chapter, occurred to me that this is a memoir of a house, and not necessarily of the author. But of course, each revelation, uncovering and discovery while building her dream home in the Wyoming Wetlands tells us something too about the author and her relationship with the land. The very first book club I ever belonged to, chose ‘The Shipping News’ (when the author was writing with the extra initial of E. Annie Proulx) as one of our first titles to read – which was way back in the early to mid nineties, and I have to confess, I didn’t finish the book, and got a bit bogged down in the detail. But then I fell into love with Annie Proulx’s ‘Close Range -Wyoming Stories’ (and no, not just because of the much touted Brokeback Mountain movie) – way before the movie, I had been astonished and riveted by the way, in this collection, Annie Proulx inhabits the psyche and very heart of the rancher, the cowboy and his environment. One of my favourite stories from this collection is ‘Job History’ and I have read it aloud many times in a book group that I convene. It breaks a few rules for short stories and gives a chronological history of a family in particular, Leeland Lee and his wife Lori and rather than build a psychological or emotional depth to the characters, it is through job histories that the story unravels and the characters are revealed, along with the fate of Highway 16 (when the bypass goes through). It is dark and unrelenting and makes no excuses for the down on their luck characters, but humorous too, in a sad sort of way. And so, I became engrossed in ‘Bird Cloud’ seeking in every sentence to know more of Annie Proulx the author and to an extent I do. Without doubt her love affair with the land, in particular Wyoming and the manner in which she goes about building her home there is an oblique and unemotional insight into her own psyche. At times I was desperate to know more of how she felt rather than what she did, and I longed for a segue into her relationships with the builders and with her family, but mostly the writing stays firmly engaged with the land, the building, the birds, the animals and her response to these. I really enjoyed reading about the James Gang who built ‘Bird Cloud’ and who seemed to inhabit the house as much as she did for most of the book, while building it. The first chapter meanders a little with references to Uluru in Australia’s red centre and Proulx quotes Thomas Keneally writing of Uluru, to convey how she feels about the great cliffs on which her home is being built and the similar rock formations. But also, a comparison with the relationship to the land of the Aboriginal tribes both at Uluru and at a place called Kata Tjuta which she describes as ‘nearby’ to Bird Cloud, both the spiritual and ceremonial and the loss of the land to the Federal government. I was intrigued too by the changes in tense when Proulx was writing about her home – at times she stayed in the present tense and then move into the past unexpectedly, already hinting at something. In the second chapter, ‘A Yard of Cloth’ the author and her sister encounter a man selling bolts of fabric and become unsettled by the man and his questioning and on leaving the shop, come across a road accident where a young man is dying in his car. In this chapter, I felt the beginning of some access to the author’s personal life that whetted my appetite for more, but this was never fully satisfied. Although, once I stopped concerning myself with the question ‘who is Annie Proulx’ and simply engaged with the story of ‘Bird Cloud’, I was fascinated. She does segue quite frequently and sometimes seems to get right off track, and the writing is interwoven with American pioneer history, social and economical, rather than her own immediate personal history. I learned a lot about cattle and sheep farming in the area. There are footnotes too, as she quotes from her wide range of reading about the area in which she lives. I was in the Golden Bay. I always think it is good to know where a book is read, as I think environment influences our response to a book. I had packed this book into the seat pocket of my kayak and we had paddled to a small beach on a calm, hot day, minus our life jackets (not our normal practice) – but we had hugged the coast and we were close to popular tourist beaches, what harm could befall us? And so it was we became trapped on a small golden beach when the tide came in swiftly and the wind picked up and we couldn’t re-launch our kayaks safely. A seal joined us. I’m not that fond of seals, so while hubby chatted to it and photographed the seal, I moved as far away from it as I could. And as we were stranded for almost seven hours, I was glad to have a book with me. Relishing the vocabulary of Annie Proulx who describes in detail the geography and history of land, fauna and flora with such ease, I realised how ill equipped I was, there on a small golden beach, to begin to describe with accuracy my own native environment – apart from golden sand, rock, gorse and ringa ringa lilies. There was so much more, grasses I didn’t know the name of, the exact nature of the rocks, and indeed why the golden sand sparkled so, as if scattered with chips of diamond (yes, I found out later from a local – silica). Too, I wondered how I could convey the beauty of the seal; it’s rather lovely necklace of fur and imagined Annie Proulx doing great justice where I was failing. 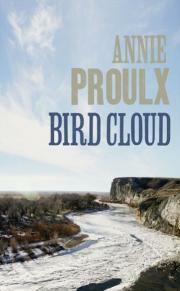 Yes, I do feel that I know a little more about Annie Proulx through ‘Bird Cloud’; her determination to see the project through in spite of severe provocations to abandon it (weather, trades people, supplies, etc) and from her response to the birdlife, the hawks and eagles she observes with such passion once she does inhabit the house. But still, I would like to know more, in the way that you do on reading a memoir, about the people who have shaped her and whom she loves, her family, and friends, their responses to her, hers to them – these details are mainly missing. And so, of course, I shall line up and buy a ticket when she comes to visit Wellington during New Zealand Book month, in the hope that I can know more about this fascinating writer. 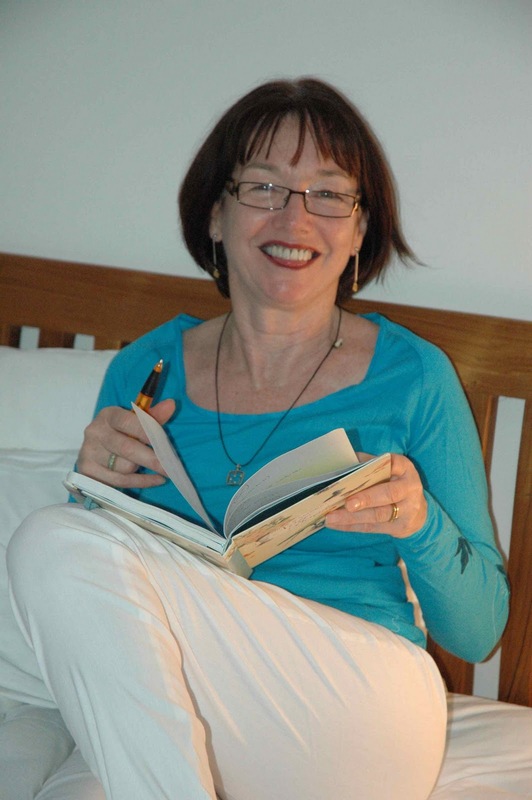 Maggie Rainey-Smith (pic left) is a Wellington novelist/poet/bookseller and regular guest reviewer on Beattie's Book Blog. Wellington 7's - poetry not rugby!